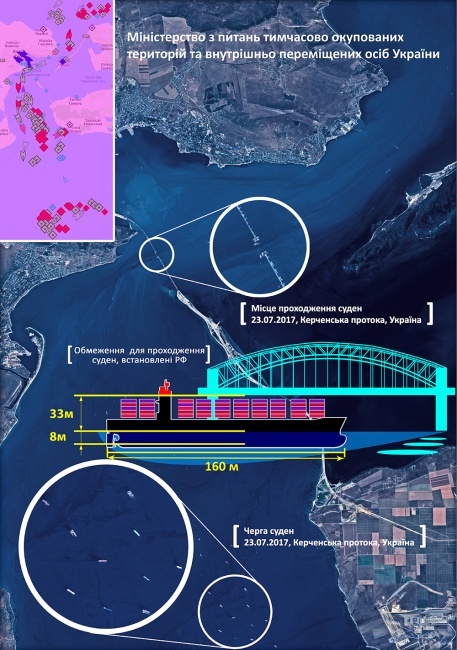 The U.S. Department of State and the European Union have expressed support for the Ukrainian authorities, who claim that the Crimean Bridge restricts navigation in the Azov Sea and will affect the Ukrainian ports. In the meantime, big bulkers continue entering the port of Mariupol. The last of them, 200-meter-high Federal Rideau, did it a few days ago. "The United States condemns Russia's construction and partial opening of the Kerch Strait Bridge between Russia and occupied Crimea, which was done without the permission of the government of Ukraine… The bridge impedes navigation by limiting the size of ships that can transit the Kerch Strait, the only path to reach Ukraine's territorial waters in the Sea of Azov. "We call on Russia not to impede this shipping," said the U.S. Department of State. The EU made a similar statement. Ukraine’s Infrastructure Ministry says that Ukraine will lose as much as 500mn UAH (1.2bn RUR or $19mn) because of the Crimean Bridge. Interfax Ukraine quotes the head of the ministry Volodymyr Omelyan as explaining that Ukraine is forced to reduce the size of ships navigating in the Azov Sea. Last summer, Ukraine’s Ministry of Temporary Occupied Territories and IDPs said that Russia had imposed restrictions for Ukrainian ships and that vessels longer than 160 meters and higher than 41 meters would no longer be able to enter the Azov Sea. This means that the maximum freight-carrying capacity of the ships navigating from and to Mariupol and Berdyansk should be 10,000 tons. According to the Port of Mariupol, as many as 144 ships that entered the port in 2016 will no longer be able to do it. This 23% of all ships and 43% of all shippings. So, this will be a serious blow on Ukraine’s overseas transport. Deutsche Welle quotes the Ukrainian Sea Ports Authority as saying that the average length of vessels entering the Ukrainian ports in the Azov Sea is 175 meters, the average draft is 9.6 meters. Acting Director of the Port of Mariupol Oleksandr Oliynyk has told a German TV channel that the port will lose almost 30% of its large-capacity fleet. 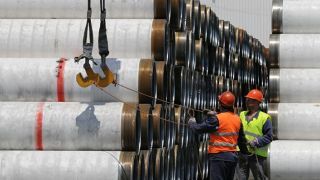 “With our breakeven point being 350,000-400,000 tons, in Aug, we will be able to carry just 160,000 tons as our key partners, Mariupol metallurgical complexes, were forced to send their products to the southern ports,” Oliynyk said. “This puts at risk the shipping of almost 1 million tons of cast iron a year to be shipped under contracts with U.S. consumers,” says the Center for Army, Conversion and Disarmament Studies. 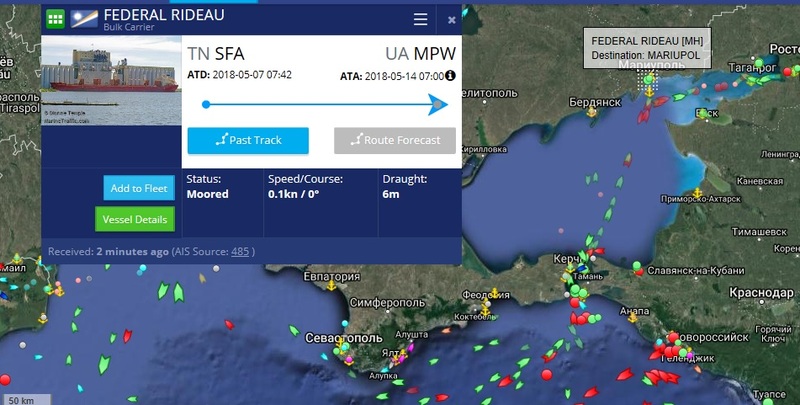 Russia’s Transport Ministry denies the charges, while EADaily’s inquiry has shown that big bulkers continue entering the Azov Sea. The best example is Federal Rideau, a ship belonging to the Marshall Islands: on May 14, it transited the Kerch Strait and entered the port of Mariupol. It is 200-meter-long and can carry over 20,000 tons. 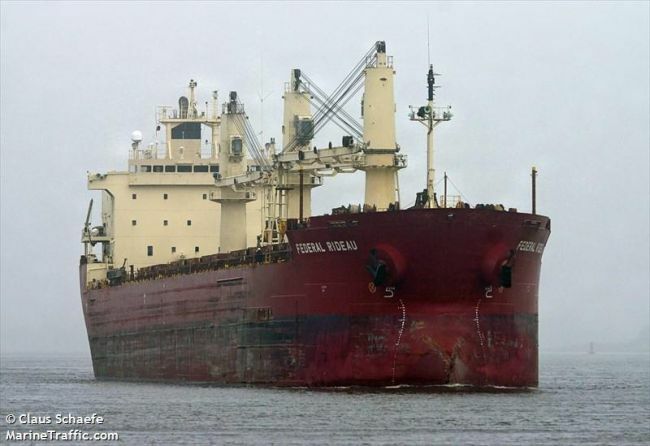 The bulker may be waiting for a cargo from local metallurgical complexes. Vse-grani.com says that in mid Nov 2017, Federal Rideau sailed off Mariupol with metal onboard. Ukraine launched its campaign against the Crimean Bridge last summer. In June 2017, Ukraine’s Deputy Infrastructure Minister Yuriy Lavrenyuk warned that the bridge posed a threat to the country’s national security as it would restrict the cargo traffic of the ports of Mariupol and Berdyansk and would affect local producers. In Aug 2017, Ukraine’s Foreign Ministry expressed its protest against the Crimean Bridge project. It said that the project was contrary to the international law. Ukraine’s Deputy Minister of Temporary Occupied Territories and IDPs George Tuka said that the bridge would isolate Ukraine. Russia’s Transport Ministry dismissed the charges and said that the Crimean Bridge would not change the geometrical, navigational or hydrographic parameters of the Kerch Strait. The maximum length and height of a ship wishing to transit the bridge can be 252 meters and 35 meters, respectively. “When designing the bridge, we kept in mind all ships that navigated in the area for decades. So, it has optimal parameters,” the ministry said.